There is a weekly, Sunday Tridentine Mass at this parish. 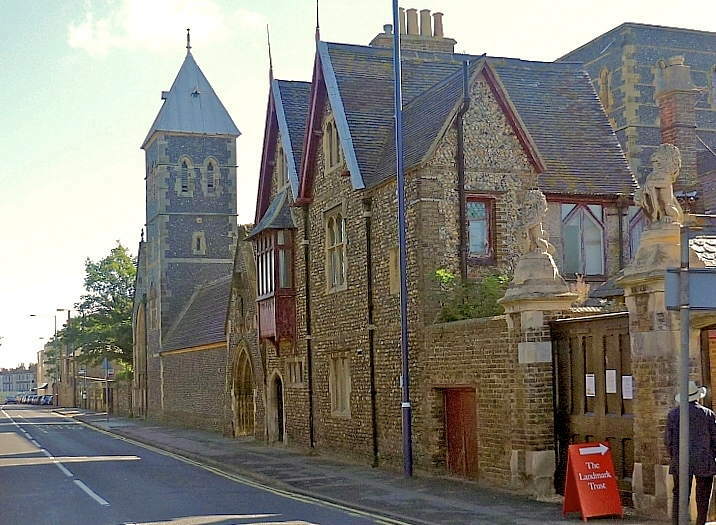 I love this church, and it is a little gem of Pugin beauty. I suppose there are enough holy wells in Ireland to fill the Thames, but yesterday I visited the holy well of Saint Ciarán of Disert-Kieran, in Country Meath. St. Ciarán the Devout who apparently wrote a 'Life of St Patrick', shares a name with two more famous saints. He died on June 14th, 775 and that date is his feast day. Now, this place is very small, with limestone outcroppings and the cold, cold water coming from the well. As it is not built up, the entire ambiance is one of prayer and peace. Gypsies place ribbons and other pieces of cloth on the trees for favors in prayer. This custom pre-dates Christianity, and goes back to the Romans, at least. I blessed myself with the water, and felt like this was the "real Ireland". May St. Ciaran bless this country with many more saints. 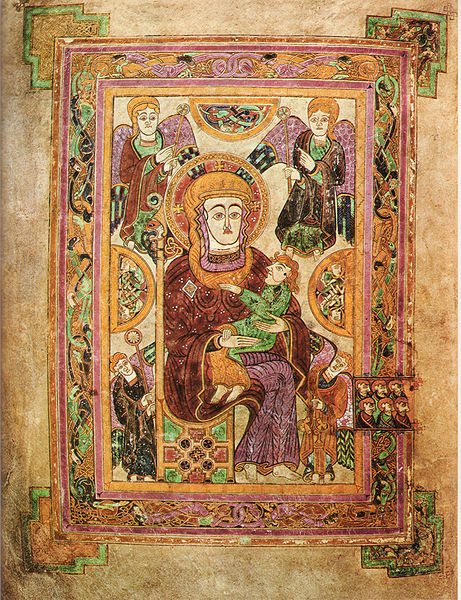 In addition, for those who cannot get to Dublin, to Trinity College Library, there is a facsimile of the Book of Kells in Kells itself. This stunning book is open to two pages, which one may study for hours and not absorbed all the symbolism. The artwork is stunning and, indeed, proves this book to be one of the treasures of the world. The fact that the original was saved from the violent Vikings is a large miracle in and of itself. 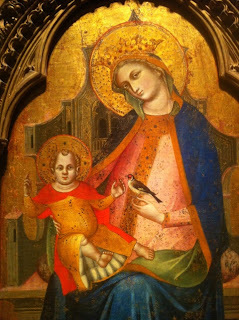 I saw the page of the earliest Western depiction of the Virgin and Child, created before 800 A.D. Here is the wiki link. And, thanks to wiki for the picture here. 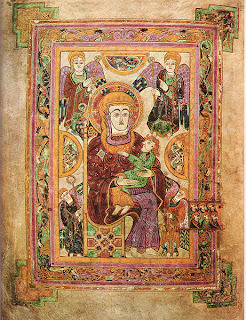 Perhaps, I am reading too much into it, but Jesus has bright red Celtic hair, and Mary, the Theotokos, has a strong, maternal Irish face. The facsimile communicated the glory of the artists. These posts seem to be popular, so I shall do two today. It is Lent, and such meditations may be helpful for some, including myself. The overlap of the Carmelite, Benedictine and Dominican spiritual ways can be clearly seen in the the call to some silence during the day. Now, as busy lay people, we must create these little shells of silence so that we can hear the Voice of God, the small, still Voice. Without silence, one is not in touch with one's own soul or with God. I have known extremely busy people. Not only are these people busy during the day, but when they come home at night, they have the television on until they go to bed. From the minute they wake up in the morning, when they turn on the radio, read the paper, run about doing necessary or unnecessary activities, these Catholics are never silent. I would be exhausted without silence. If I do not have time in the morning and in the evening, at the very least, for reading Scripture, one of the Hours, such as Vespers, I cannot act as a serene, human being. Silence gives me grounding for the entire day, and if I practice silence, it can remain within me for the entire day. This is the beauty of silence, it becomes a wellspring of life within us, overcoming other noises and confrontations. Silence breaks down anxiety and fear. The most fearful people I know cannot bear silence. They must keep moving, keep doing, even if they are retired. The rhythm of life which includes silence gives a richness to one's existence and keeps one from falling into superficiality. Why some people are afraid of silence is that they are afraid of suffering. In silence, I see my sins, my failings, my failures. In silence, I face the need for conversion daily. In silence, I meet God, who is All Goodness, All Innocence, All Perfection. Only in Faith can one approach silence, as in silence one meets the God of Mercy and Forgiveness. I have talked with friends as to how to create more silence in their day. Some want to do so and some want to keep running away from God, which to me, is running away from Love. Silence is never boring, as some may believe, unless one thinks God is boring. The Infinite is so beyond me, that only is silence can I meet God. We are fast approaching Holy Week, when in the Passion of Christ, we see Him keeping silent before both the Sanhedrin and Herod. 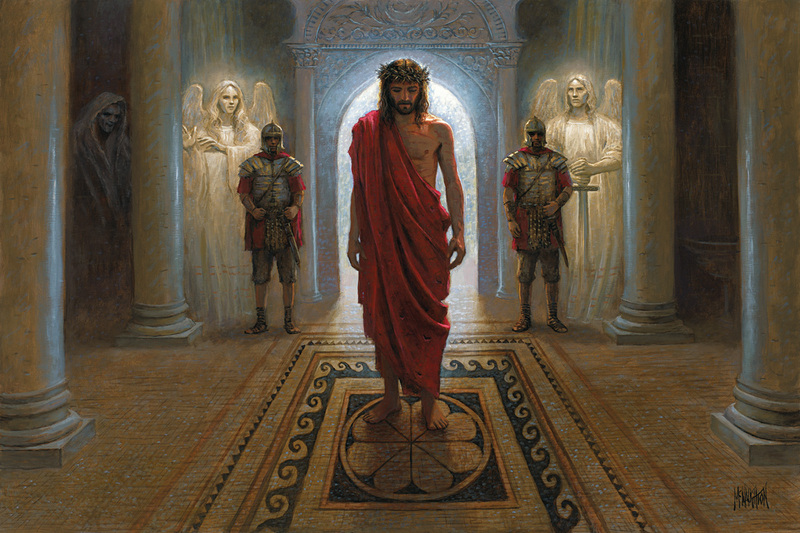 Christ said little in front of Pilate, but He was calling Pilate to Himself, and was trying to make the Roman see. 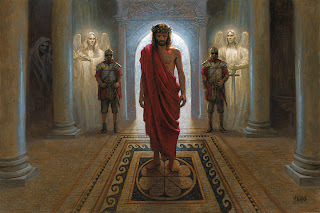 Christ remained silent because He did not need to defend Himself. He is God. He is Man. He stood in silence, in Perfection, and those who judged Him unfairly could not see the Silence which stood before them, as they had never met Him in silence. Those who meet God, know Him when they see Him. Reading Garrigou-Lagrange again and again, I am struck with the idea of docility. Now, some of us are made more or less docile. As a person with a strong will and strong character, docility is something I have had to learn. My saintly mother, who is 84, is docile by nature, most sweet-tempered, and a joy to be around. Not all of us are created the same. The idea of modern psychologically which states in popular terms that we can be all we want to be is simply not true in one sense and very true in another. Garrigou-Lagrange insists that docility may be learned or acquired by all, and should be the goal of the saint. In fact, one cannot grow in holiness without docility. Now, docility is not “wimpiness” or a lack of character. One must have character and person-hood in order to seek spiritual docility. To live in fear, fear of anything or anyone, is no docility. In fact, really craven fear hinders one from coming to trust in Providence, another great theme of Garrigou-Lagrange. Unless one trusts in Providence, one cannot grow in docility of spirit. Perhaps two of the most individual and strong saints, mentioned last week on this blog, SS. Teresa of Avila and Therese, the Little Flower, demonstrated in their autobiographies, that they had powerful, personal characters. They knew who they were, they knew their talents and limitations, they were capable of facing their own lack of perfection and cooperating with grace to attain such perfection. In my little mini-series on perfection, in which I have tried to make Garrigou-Lagrange more accessible to modern readers, I have found that the simple message of perfection rests in the desire and seeking of docility. Now, for any woman in the modern world who is a feminist, my statement sounds like heresy. In the age of the emerging woman, which is a false idea by the way, as one only has to look at the great saints here mentioned, plus SS. Etheldreda, Gertrude, Brigid, Bridget, Matilda, Hilda, Eanswyth, Catherine of Siena, and so on to see powerful women acting in public spheres in the Church for centuries, women are supposed to be what I call “Bolsheviks”, that is, contradictory and totally independent. Of course, this is a physical, psychological and spiritual impossibility, created to destroy vocations as well as society. The Bolshevik mentality lends itself to splendid and, indeed, painful isolation. Some men fall into this mode of being, to the loss of their soul's growth and even salvation, as it is in dying to self that one gains heaven. Docility requires greater courage than action. One must control one's desires, tongue, plans, in fact, give up control one's own life and trying to control the lives of others. This is also a goal of the Benedictine Rule, which I love so much. To be obedient to one's superior is to give up control. To give up control, is to become docile. Obedience, dying to self, docility. The great spiritual masters, such as Garrigou-Lagrange and St. Benedict tell us that this is the only way to happiness and holiness. As Garrigou-Lagrange notes, the ultimate docility is the giving of our soul completely to God. This action is connected to detachment and to listening in contemplation. By the way, without some silence in one's life, one cannot attain either docility or detachment. Silence is the absolute sine qua non of the spiritual life. How does one make Dwarves into heroes? For the coming movie of The Hobbit, the Disney idea of dwarves simply would not work. The idea of small creatures (they are not homo sapiens in Tolkein's world) being mighty warriors and winners of battles has been deftly portrayed by the actors and make-up personnel of the coming epic. I share a photo from one of the fan websites. If I had boys and girls at home adolescent age and up, I would encourage this type of movie, as they need role models of all shapes and sizes. The Church Militant in the making, that is our children, can learn good material and spiritual lessons from The Hobbit.